Who, me? It’s not my fault…we sometimes want to say. Blaming someone else for our sorry situation can be so tempting. When we mess up, pointing at another promises to be the easy way out. That’s what the Israelites did. Have you ever complained like that? I have. Goodness gracious, where is Moses when we need him? Deep into our own struggles, we end up terrified like the Israelites. We grumble in the hot desert of frustration. And as we trudge through the dry land of conflict, of uncertainty and nervousness, we desperately look to be rescued. But no one is there to do the rescuing. And when peace is gone, like those Egyptians, stress and anxiety come after us, threatening to ruin our day. That’s because in the still of God’s presence is when our nights know His peace. In the still of our heart is when His whisper brushes through. And in the still of the moment is when we see His promises come alive. 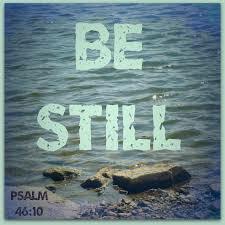 Can you tell me, in the midst of your hectic life, what keeps you from being still?